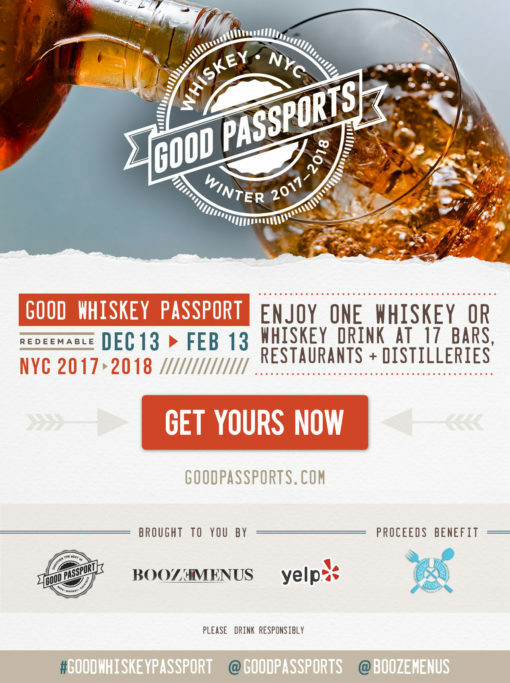 Good Passports, BoozeMenus, and Yelp NYC have teamed up to present the Good Whiskey Passport, which will act as fund raiser for Rescuing Leftover Cuisine. When you purchase a Good Whiskey Passport, you’ll get one whiskey cocktail or a neat pour at every participating location. Each participating location will offer you the choice of at least 1 of 2 whiskey cocktails or a neat / rocks pour. Cocktails are based on 1.5 oz pours of liquor. You can use the passport on any day, at any time from December 13, 2017 through February 13, 2018. When purchasing a Good Whiskey Passport, choose the location where you would like to pick up your Passport. Passports are available for pick-up from December 13, 2017 through February 13, 2018. Pick up your Passport at the location you chose any day from December 13, 2017 through February 13, 2018. Bring your Passport to each of the participating locations any day from December 13, 2017 through February 13, 2018 and choose one cocktail or neat pour. Ask the bartender which cocktails or spirits you can choose from.